The Toneprint series of pedals that TC Electronic launched earlier this year seems to be sending ripples throughout the fabric of the effect industry space continuum. Not only do they bear the legendary TC sound quality but they also have a USB input to load ‘artist profiles’ that will change the caracter of the pedal. Before you ask, you cannot create your own tone print profiles (yet), they are made in the TC factory and can be downloaded for free. I was in the market for a modern delay pedal that featured analog simulations as well as dotted eighth rhythmical delays with on the fly tempo adjustments. 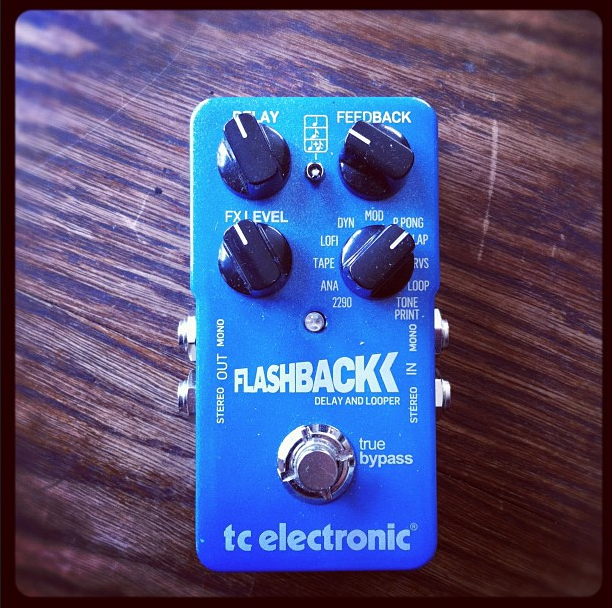 So I went to a store and tried the TC Electronic Flashback Delay. Let me say I was instantly taken away by the wealth of possibilities as well as the sheer tone quality. It had been a long time since I had come across such an inspirational piece of gear! I deliberately did not try the other pedals in the Toneprint series in order to avoid burning my credit card but the temptation was strong. 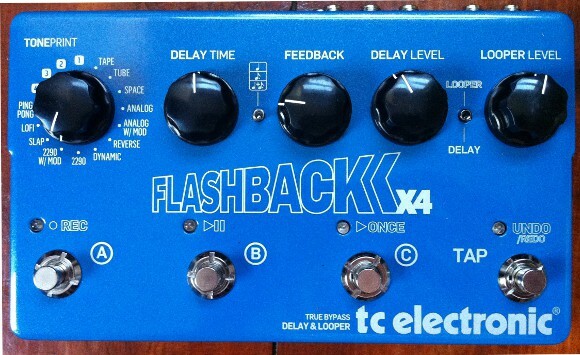 Here is a review of the Flashback Delay featuring the obligatory video demo. The Flashback delay comes in a compact format (think MXR compact) and is a true stereo pedal featuring two inputs and two outputs. It can of course be used in mono as well. There are 4 rotating knobs: the classical level,delay time, fx level found on most delay pedals (see my post about the delay basics) and a 4th knob used to select the mode. The delay time goes from 20ms to 7s (yes 7000ms!). Lofi: in this mode the repetitions get really dirty, I don’t find it really effective with distorted tones as it sounds like ‘dirt on more dirt’. The Flashback Delay also features a little three way switch that affects the rhythmical tap tempo based delays. 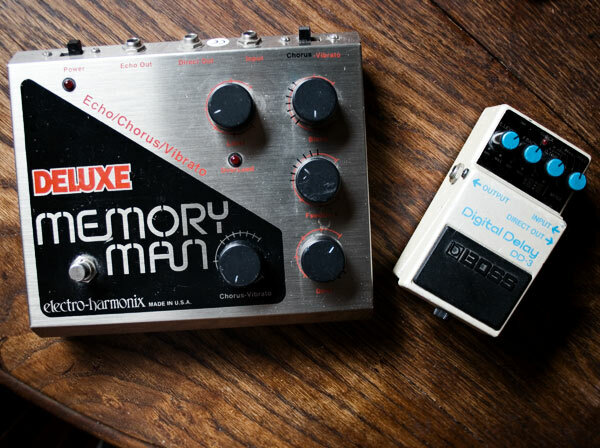 You can switch from quarter note to eighth to dotted eighth (the famous U2 delay). This 3 way switch is particularly effective when paired with the “Audio Tap” functionality of the Flashback Delay. To activate it, just leave the pedal switch pressed until the pedal goes silent and strum your guitar to the desired “speed”. Release the switch and here you go, the delay time between repetitions is set to the “rhythm” of your strumming. Some of you might prefer the foot based Tap tempo feature that most other delay pedals feature but as I read once in a forum, TC has got a point in a sense that most guitarists are more precise with their hands than with their feet. I did encounter a bit of an issue with the Audio Tap feature of the Flashback Delay when placed in the loop of my Marshall JMP-1 preamp. It seems than on the distorted channels, the loop lets some sound sip through even when the Flashback delay goes into Audio Tap mode and ‘blocks’ the sound. This is apparent in my video below. Note that this is a flaw in the JMP-1 and not in the TC pedal which goes completely silent when placed in a “normal” pedal chain. Note that the Flashback Delay harbors two switches inside the pedal. The first one allows you to choose between True Bypass or Buffered (nice!) and the second one suppresses the dry signal in buffered mode to optimize the use of the pedal in effect loops.